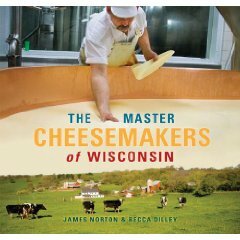 Buy ‘The Master Cheesemakers of Wisconsin’ Today! My friends and Heavy Table colleagues Jim Norton and Becca Dilley have a new book all about my favorite subject – cheese! More accurately, it’s about Wisconsin’s master cheesemakers (like the Obi-Wans of cheese) and it is awesome. You can read my interview with Jim and Becca on Heavy Table today, and be sure to buy their book, too! In case my totally biased opinion doesn’t sway you, perhaps other opinions will. Our dear friend Madame Fromage gave the book a rave review in the Madison newspaper The Isthmus, and today Jim and Becca are profiled in the Wisconsin State Journal. Check out their blog for more reviews and information on their book tour.